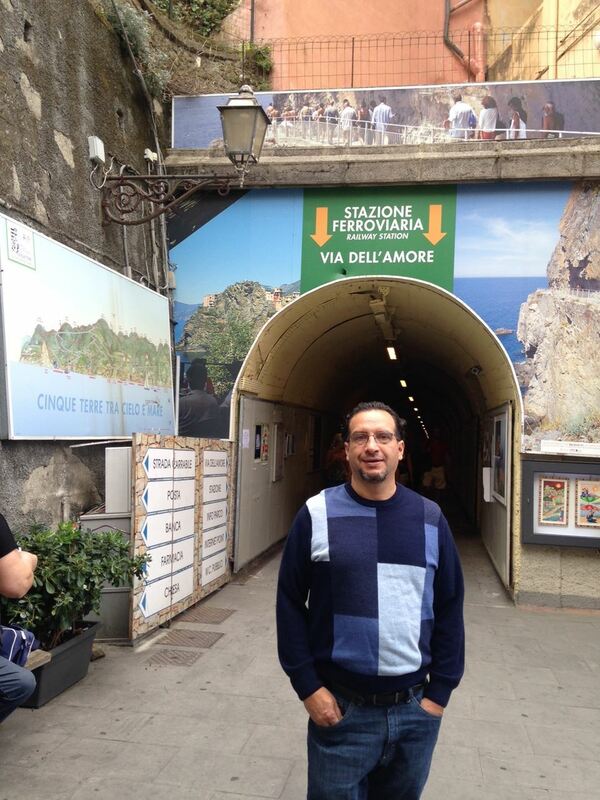 Two years have passed since the ICC's last educational travel adventure in Sorrento, Italy. It's time to travel to Italy, and to study Italian there once again! A group of 10 ICC members have been meeting, getting to know one another, and they are ready to pack their bags and head for Lucca, Italy! This year's experience will occur in the region of Toscana (Tuscany), in the delightful city of Lucca. Group members will arrive at the Florence airport, and gather together, on Saturday, September 24th. Shuttle driver, Bruno, will be ready and waiting for us, and he will whisk us off to Hotel Piccolo Puccini to meet members of the staff at the Lucca Italian School. All of us are ready to begin our studies, walking to our new school, and attending Italian classes each morning. Our itinerary consists of many wonderful excursions in the area, cooking classes, bicycle rides along the wall, and numerous other exciting experiences. Our group this year consists of three guys: Brian, Andy, and Fabio, as well as seven gals: Elena, Joan, Pat, Janice, Janell, Deb and myself. We will surely miss former participants, Tom and Julie, who were forced to cancel due to some health concerns...nothing too serious, thankfully. Stay tuned, in the days ahead, and you will learn much more about Lucca, as well as the fascinating members of our third group. Lucca is a walled medieval town on the Roman route. Our hotel, Piccolo Puccini, is near the church of St. Michael. On the other side of the hotel is the Puccini Museum. A cartouche, on the adjacent building honors Puccini as that is his family home and where he was born. Paolo is our innkeeper. I asked him if Italians love to talk to which he explained that the spoken word is very important. The best negotiators are Italian. This is day 2 or 3 depending on your arrival date. Yesterday, Sunday, was a free morning. Some of us took advantage of that and slept! In the afternoon, we had a brief tour of Lucca, with Angelo under blue skies and great weather! The school is about a 20 minute walk from our hotel. Along the way, it is easy become side-tracked with an array of gelato and other sweet shops. Then, the big test given by Daniela to decide what level of Italian we all speak. It wasn't too stressful. The school is by the St. Francisco monastery, in a picturesque area near the old wall. A fabulous evening followed with a concert of primarily Puccini operas. The orchestra choir, and soloists, were all volunteering for this concert which was a benefit for victims of the Umbrian earthquake. We walked to our supper hosted by Daniela. Two students, from Australia and the Netherlands, joined us. But for dolce, there was an even bigger surprise....all of us enjoyed the blarney of a pink leprechaun!!!! On Tuesday, September 27, we received a special treat after school. A van picked us up at the school, at 3:00, and we headed for the hills outside of Lucca. We arrived at the Fattoria (means farm) di Fubbiano where we received a private tour of their winery. We were able to sample glasses of their red and white wines. We were given aprons and told how to prepare our 4 course meal. We proceeded to make Carpaccio di zucchini con scaglie di parmigiana e menta, Tagliatelle con porri, zucchini e noci, Pollo al limone e erbe aromatiche, Verdure miste al forno, Insalata, and Cantuccini con il vin santo. WOW! Three hours later, we sat down to our delicious meal and had more wonderful wine. Eva was our head chef and is a teacher at the Italian language school. She had her cousin, Tamera, who helped to put on this great feast. 99% of the students were speaking Italian during this wonderful event, but since I am the only beginner in our group, I had to try to catch a few words here and there. Lucca ia a lovely city, and Italian people are so friendly and beautiful. There is a bonus - The weather has been beautiful every day!! This has been an amazing experience with the Lucca Italian School, so far. We finish our first week of classes tomorrow. I am in an advanced class, in which I am the only American student. Out of nine in my class, there are only three others whose first language is English, which forces us to communicate only in Italian. The diversity has made the class a very interesting, fun, and unique learning experience. Of my classmates, four of them are expats living in Italy full time. One is a Japanese businessman who imports construction materials. He has lived all over the world, speaks many languages, and has decided to settle in Italy, living just outside of Lucca. Another is a Korean girl who is a liutaio (violin maker) who is studying under a Lucchese maestro. She will be living here for the next three years of her study. The third is a Russian housewife and mother who is married to an Italian businessman; his work has taken them all over the world and they have just moved back to Lucca from 3 years in Dubai. The fourth expat is actually a former member of the ICC who moved to Lucca! (Small world!) The rest of my classmates are vacationing Italian students, just like the rest of our ICC group. Two from England, one from Holland, and another from Germany. Students are placed each week according to their skill level. The school groups students so that there will be no more than 10 per class and tries to ensure everyone in each class is on an equal level. This is very much the case with my class. Even though there are nine of us, we are very well matched. Since the class is more advanced, we've spent most of our 4-hour daily classes conversing. Our instructor, Antonella, usually starts the day by priming us with questions about how we spent the previous evening, which often leads to a lot of fun discussion. She then introduces an exercise, like reading or short writing exercise that is geared toward a specific grammatical subject (proper use of "ci" and "ne" or conditional verbs, for example), which we sometimes do alone or with partners and then discuss as a class. These discussions often take on a life of their own, bouncing examples and what-ifs back and forth between each other and with the instructor. I have never felt as comfortable using the language as I do on this trip--it is such a wonderful experience. 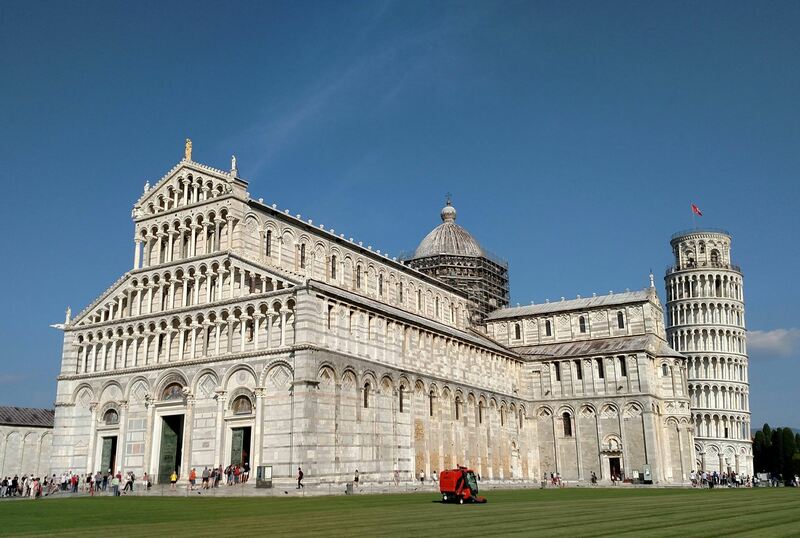 As for our continued adventures, several of us went on an optional afternoon excursion, offered by the school, to nearby Pisa with my instructor. She gave us the "locals" version of a tour, which, of course, included the famous Piazza del Duomo, but also the city itself. We went along some of the main streets, piazzas, around the University, and along the picturesque Arno, lined with beautiful gothic and typical Tuscan buildings. She provided a very detailed and interesting history of the city and sights, all in Italian. This afternoon, the school hosted a special afternoon trip for our ICC group to Pietrasanta, a small town near the sea, northwest of Lucca. It is an important place due to its history involving Michelangelo and other famous sculptors, which continues through today as we saw in a museum dedicated to displaying the prototypes of many famous sculptors' pieces, ranging over several hundred years through the present. Check back for a report on our upcoming visit to the Cinque Terre this weekend! Thursday afternoon, our group met Ilaria, from the Lucca Italian School, at the train station for an excursion to Pietrasanta. Even with a change of trains in Viareggio, it was a short ride there. Pietrasanta is an important town in Italy for artists, especially sculptors. Michelangelo even signed the contract for the marble for the Medici tombs there. The main piazza and a deconsecrated church serve as a focal point for statuary installations. A display by a contemporary Albanian artist adorn both the square and inside the church. Next to the church, in an old convent, is housed a library and museum. The museum displays many of the sculptors' models, called bozzetti in Italian. The sculptors would complete small versions of their works that would often become marble or bronze statues. After visiting the museum, we walked down one of the town's streets with many upscale shops before stopping for gelato. The gelateria, Cuore di Gelato, served an extraordinary product. Molto delizioso! After enjoying our gelato, we visited the church of Sant'Antonio e San Biagio to view frescoes by renowned Columbian artist, Fernando Botero. "La Porta di Paradiso" and "La Porta dell'Inferno" were completed in 1993 featuring Botero's famous overstuffed figures, including Hitler in the inferno and the recently canonized Mother Theresa in the Paradiso. One of Botero's statues graces one of the piazzas in the town. Botero has even taken up residence in Pietrasanta. Pietrasanta is the birthplace of Eugenio Barsanti. He is famous for his invention of the internal combustion engine. We stopped at a local bar for an aperitivo before heading back to Lucca around 7 in the evening. Pietrasanta, off the beaten tourist path, turned out to be a refreshing place to visit. A special thanks to our guide, Ilaria, for a wonderful afternoon. Saturday, October 1st, we had a group excursion to Cinque Terre, located on the west coast of the Ligurian Riviera and consisting of five villages: Monterosso, Vernazza, Corniglia, Manarola and Riomaggiore. Of these five, we visited two- Manarola and Monterosso. Manarola, built on a high rock and overlooking the sea, offers boat rides which we were able to experience and offered a different perspective of viewing the villages from the sea. Monterosso, the largest of the villages, is located on the hills which are cultivated with vines and olives and looks down on beautiful beaches and clear waters. Here we had some free time to look around before joining up with the group for a wonderful lunch of pastas, seafood and of course, vino! After lunch we had more free time to explore the village before heading back by train. The forecast had called for rain most of the day, but we were fortunate enough to have it hold off until our return back. 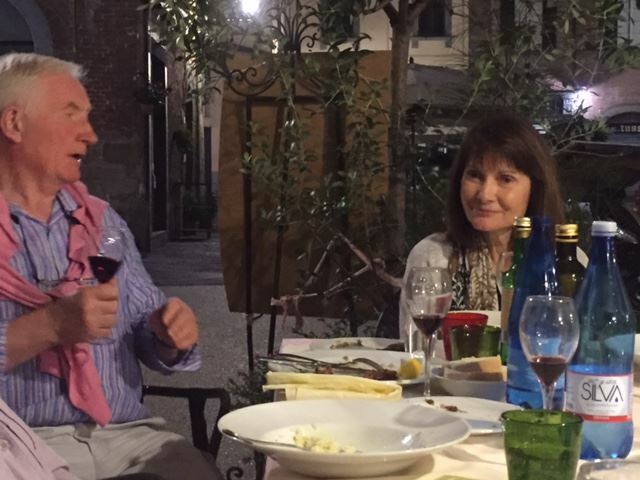 I have really been enjoying my experience in Lucca and will return with many wonderful memories and stories to tell. We are traveling with an interesting and diverse group of people and it has been great getting to know everyone. (A few fun facts: Janice carries Mortadella in her purse, watching Teletubbies in Italian is a great way to learn vocabulary, and Peggy had made it explicitly clear that Duluth is NOT part of the Iron Range!). Apart from our time with the group, Fabio and I have had fun exploring the city and have even ventured out of the walls to take the train to Viareggio. We decided to do this the day everyone went to Pisa, since we had already been there. Interestingly enough, we wound up in Pisa anyway because we got on the wrong train coming back!! However, our Italian lessons came in very handy in asking for help from a lovely woman who not only told us which track we needed to be on, but actually walked with us right there, even though that meant her having to cross over the rails to get to her own train! Lucca has been ideal for us to practice speaking Italian, experience the beauty and culture of the city as well as meet many wonderful people! .... Grazie ICC! "Ciao tutti" is the email greeting that we often receive from Peggy. She is a terrific coordinator and leader -- making sure we have timely information to join the group --- walking to school, going out for a meal or being ready for an activity. It has been a successful first week, and I attribute so much to Peggy. The group gets along very well. We represent a range of experience with Italian language, travel, culture and family experiences. It is extremely interesting to hear the personal stories of those in our group, from other students in our classes, from our teachers, and from those we meet at restaurants, the workers/proprietors of the hotel, or in shops. We take time to chat with the people around us, and so it is a rich opportunity to learn not only language, but culture and Italian life. I attended the Lucca Italian School a year ago with a friend and my daughter, and so the rhythm of the school and the sights of Lucca are not new to me. But it is really interesting to be here with nine other Minnesotans and to see the school and the city from their fresh eyes. I'm so glad that I am part of this group. My grandmother was born in Lucca in 1876 and my grandfather was born in a nearby city, Montecatini Terme, in 1877. They emigrated to the US in the early 1900s, both leaving family behind in Italy. 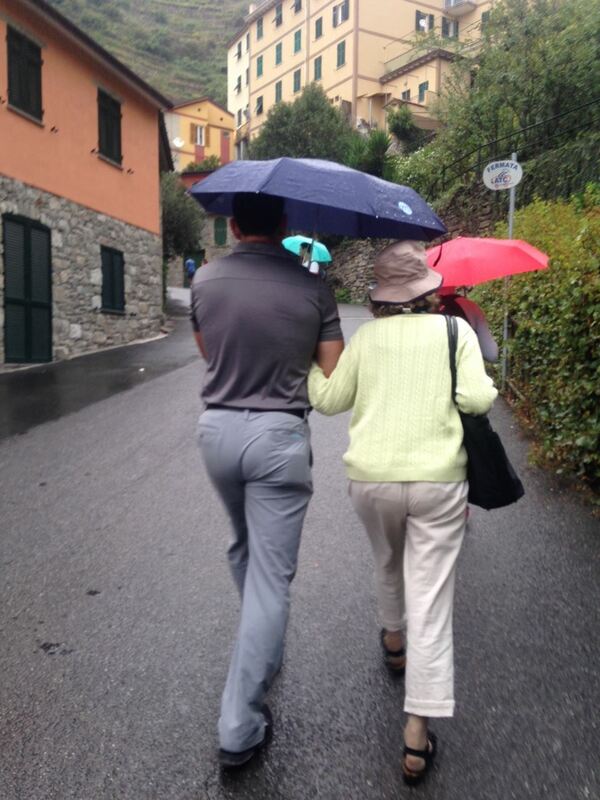 Luckily, my US family has known the Italian cousins on my grandfather's side quite well for decades. Then last year, with the help of Angelo, one of the directors of our school, I discovered the family of my grandmother's family still living nearby. So, in addition to school and outings, I have been visiting family. Four generations of the Gentili family love to gather for a meal, share stories, laugh, and connect. Two wings of the family say they only get together when the Americans are here. The meals are noisy, long, and delicious, starting typically around 8-8:30 pm, often lasting 2-3 hours. I'm very tired at the end of the meal, trying hard to understand what's going on around me. They talk too fast! Piano, piano (slowly, slowly) doesn't work when they're talking in a group. But I love every minute of it, and my Italian language skills are improving as a result of the immersion experience. There is really nothing like it to learn this beautiful language. Today the group gathered in the afternoon to go on a planned excursion with one of our teachers, Eva (who also taught us cooking last week). We traveled by van about 30 minutes north to the Garfagnana area of the Appenine mountain range which runs along the spine of Italy. The area is also called the Apuane Alps. 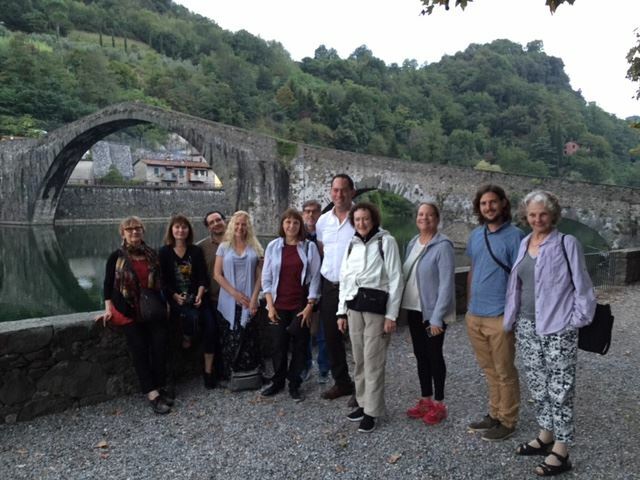 We made three stops: in Colognora, a small town at the top of a very winding road; in Gallicano, a small town along a river; and at the Ponte Maddalena, a very famous bridge. The small town of Colognora di Pescaglia is known for two very different things. 1) Chestnuts were the base of the local economy for centuries. We toured the Chestnut Museum - Museo del Castagno (free, proudly narrated by charming local volunteers). We marveled at the genius of the local craftsmen in processing the chestnut wood to make things for the home and work, and for making flour and baked items from the chestnuts. 2) The Spike Lee film about World War II and the Buffalo Soldiers was filmed there in 2008. The area was peaceful and beautiful. 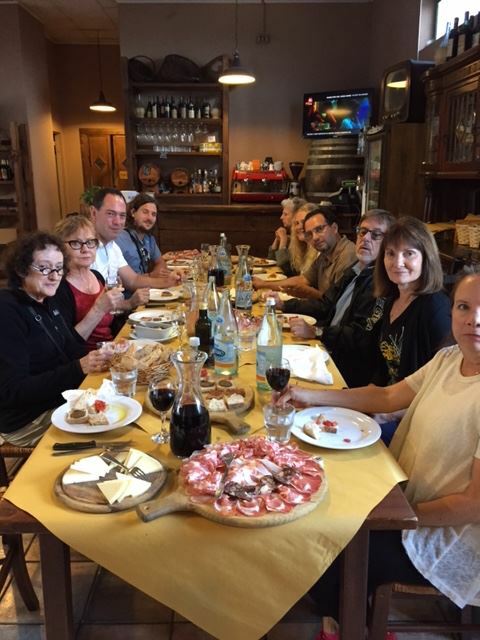 Our second stop was about 20 minutes away for a "snack" at the Mercato Contadino restaurant in Gallicano, along the River Serchio. The "snack" included four types of bruschetta, four-five types of proscuitto, three types of pecorina cheese, two types of wine, and pane/bread. We finished with coffee and limoncello. We are definitely eating well on this trip. Our last stop was nearby at the Ponte della Maddalena, also known as the Devil's Bridge. It was constructed 1000 years ago and has a colorful origin story. It provides stunning views along the river and in the valley. 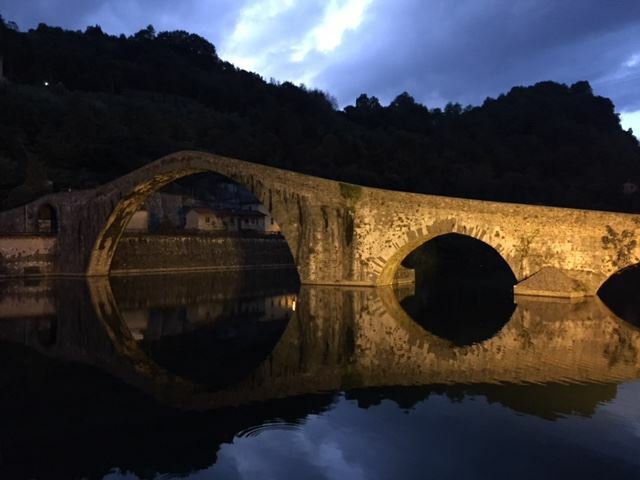 We were there at dusk, and so the light was perfect to end our day in Garfagnana. Tomorrow we return to classes for the second week. It's hard to believe that today starts our second week of classes. Our days have been busy with classes, activities, visits to various locales and, of course, sharing food and wine with the wonderful members of our group. As usual the warm morning sun accompanied us on our walk to school. 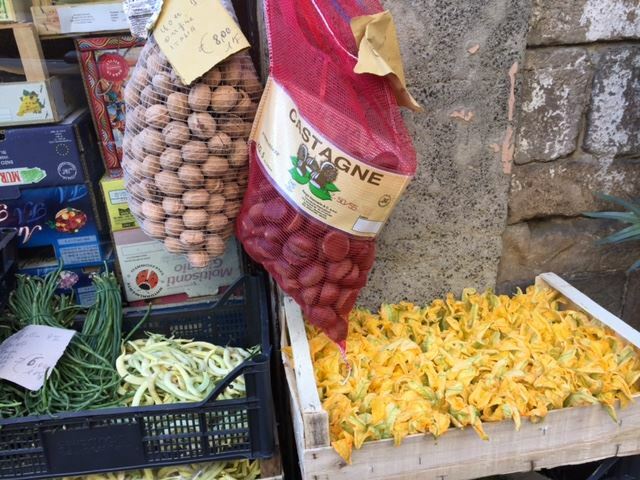 Joan showed me a new route to school which took us past a vegetable shop that had a flat of bright yellow zucchini blossoms the color of the sunshine -- a beautiful sight to behold. New students arrive every Monday. My class changed from all native English speakers to only half English speakers. Two students are from Germany, one from the Netherlands and one from Thailand. Pia, the student from Thailand, is working in Lucca as an artist and trying to learn enough Italian to get a driver's license. This diversity offers an opportunity to hear Italian spoken with a variety of accents and is an enrichment to the overall experience of studying in Lucca. Later in the afternoon one of our teachers led a bike ride on the wall which afforded the city protection during medieval times. The wall is wide and and shaded. Lucca has developed it as a recreational area for walking, biking, roller blading and use by an assortment on non-motorized vehicles. I chose to walk while my fellow students biked. Walking on the wall I felt I was on the cusp of two different worlds. On one side I was saw the buildings and streets of a medieval city that was untouched by time; on the other was the hustle and bustle of a modern city. A peaceful green fills the space between the wall and the busy city. As I watched many local residents enjoying quiet of this special space, I marvel at the ease with which the people of Lucca accommodate the offerings of both worlds. "Non si puó pensare bene, amare bene, dormire bene se non ha mangato bene"
Lucca is a city enclosed by medieval walkable walls, tiny streets and cobblestone alleys filled with crowds at all times. As you enter the walls and take a short walk, you'll encounter many restaurants, gellaterias, pizzerias, bars, enotecas and a vast variety of unique businesses to eat, drink and shop. The restaurants and bars offer local food specialities and drinks while enjoying the beauties of the city. 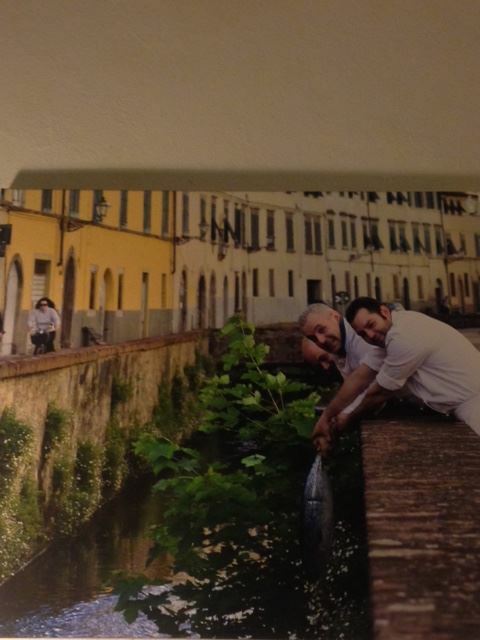 When we arrived in Lucca we made a resolution to eat at a different restaurant everyday. However, after our meeting with Pasquale Gubitoso (owner of Ristorante, Da Pasquale) and having a private tour of the his restaurant, in which he opened a bottle of his signature wine and talked to us until 2am, we decided to visit it few times. Pasquale is the most generous man I've ever met! We made a reservation at Da Pasquale to celebrate our 20th anniversary. Pasquale made the experience a memorable one. 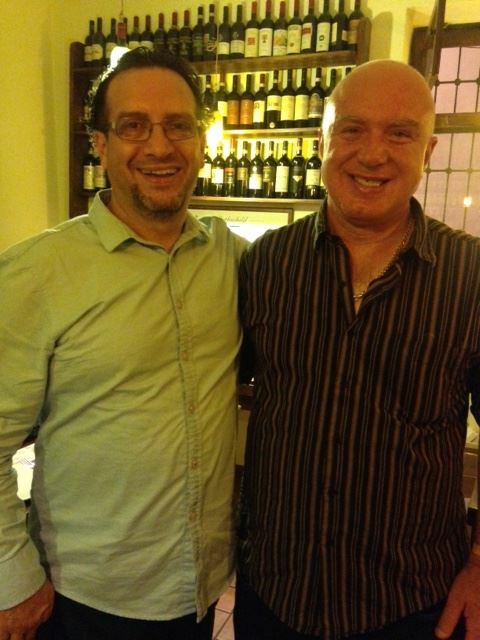 This restaurant was absolutely my favorite, not only because the food and the wine were superb, but also Pasquale made the occasion unforgettable--the best host, the best food and the best wine in Lucca! This is the only restaurant in Lucca we've encountered where you need a reservation many days in advance and now I can attest to the reason why. This trip for us has been about eating good food, meeting new people and practicing speaking the language. On one dining adventure, Brian enjoyed a fresh catch from the canal, I unknowingly ate raw meat (carpaccio) and Janell had her meal in a baby food jar (vasolino). 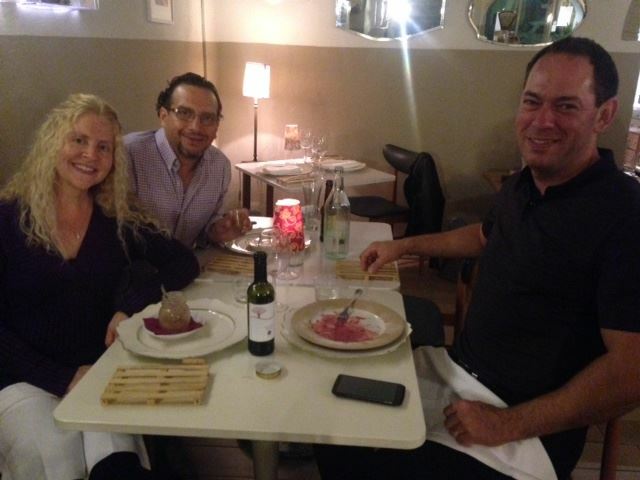 We have run into many interesting people from around the world while trying a steak a la Fiorentina (chiannina), tasting wine or beer and eating gelato (often for breakfast). I have also improved my vocabulary with applicable words and phrases such as: "pancia de birra" (beer belly), "luppolo" (hops), "degustazione" (tasting) and "birrificio" (brewery). The cooking lessons without a doubt were the most memorable experience I had with the group. 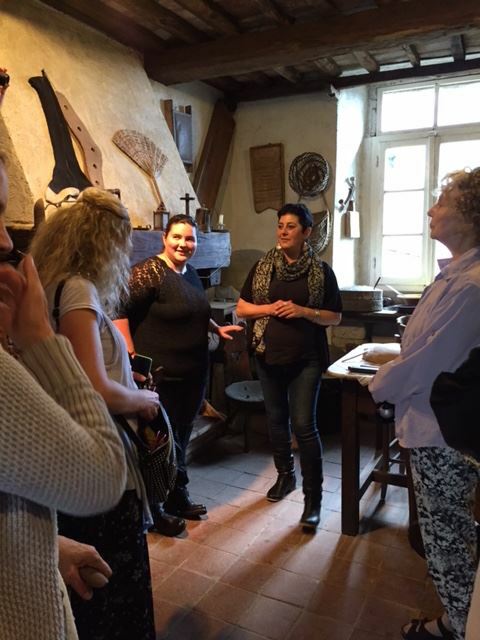 Our instructors, Eva and Tamara, introduced us to typical dishes while cooking and tasting wine by their side. I can't wait to get back home and experiment with all the recipes I've learned to prepare! 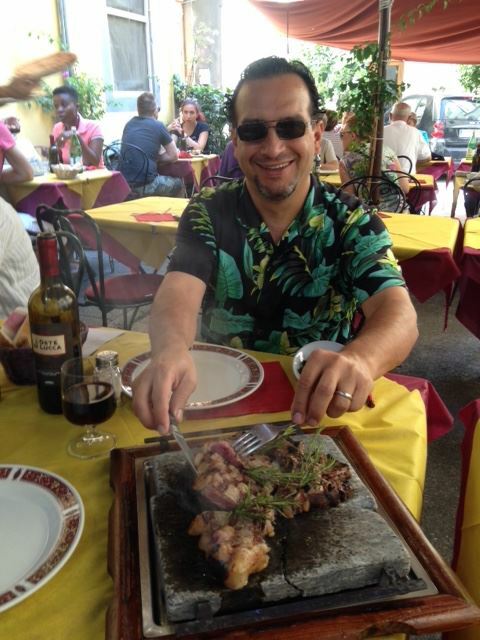 Lucca is a wonderful city for many reasons, but overall, for me, it has been a gastronomic adventure! 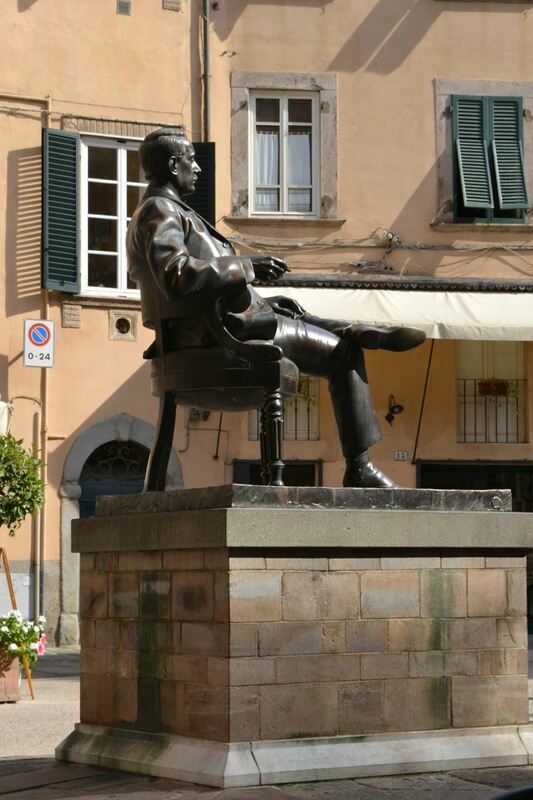 Lucca is the City of Giacomo Puccini. He was born in Lucca in his family home in Via di Poggio on December 1858. His family was very musical - his father taught music and his mother was a singer. He was baptized in the church of San Giovanni and later held a position as organist and church musician. He studied at the Milan Conservatory after realizing that he did not want to be an organist but an opera composer. He was inspired by Verdi's operas and showed great talent for writing beautiful melodies. In 1891 he had a villa built in Torre del Lago on Lake Massaciunccoli which we visited. The beautiful setting on the lake, the peace and harmony which he found in nature were an inspiration for his operas. He composed most of his beautiful operas when he lived at the Villa Puccini - Manon Lescaut, his first triumph in 1893, then La Boheme, Madama Butterfly, Tosca, La Fanciulla del West,Turandot and other operas. Five generations of the Puccini Family had lived in the villa in Torre del Lago which today is maintained as Museo Villa Puccini in its original state and decor. 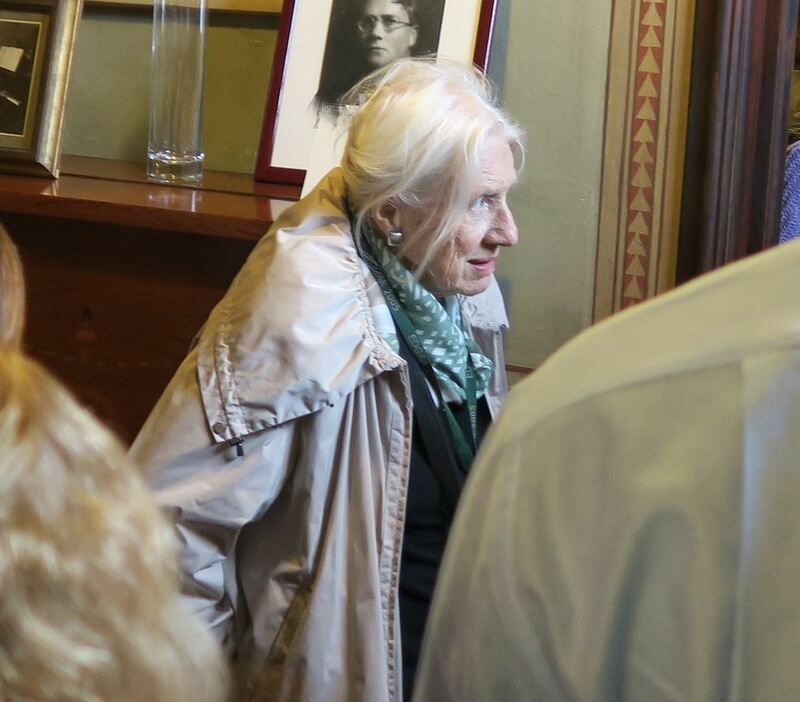 When we entered the villa we were greeted by Simonetta Puccini, the maestro's grand daughter. Meeting her was a highlight of my visit. She is 88 years old, speaks fluent English and has visited the United States on several occasion. She is the president of a foundation which maintains the museum. Every room is filled with Puccini's portraits at different stages of his life, photos of his wife Elvira, his friends and family, as well as photographs of important people who visited him in Villa Puccini, from the Duke of Windsor to Thomas Edison to Toscanini. His piano and his desk where the opera scores are laid out are in the main room. Puccini was a very ebullient man who had many friends and many passions. He was also a heavy smoker and several photographs, as well as a full sized sculpture in the town square show him smoking a cigarette. A funeral mask of his image is also displayed in the parlor. There is a small pretty chapel in the house, but his remains were placed in the wall behind the piano in the main parlor. He died in Brussels in 1924 after an unsuccessful surgery for throat cancer. Puccini loved sailing and owned four sailboats with his son Antonio. He also collected automobiles and was a hunter. His gun room contains numerous guns, as well as trophies. We excited to a veranda decorated with paintings of his artist friends, who were frequent companions. 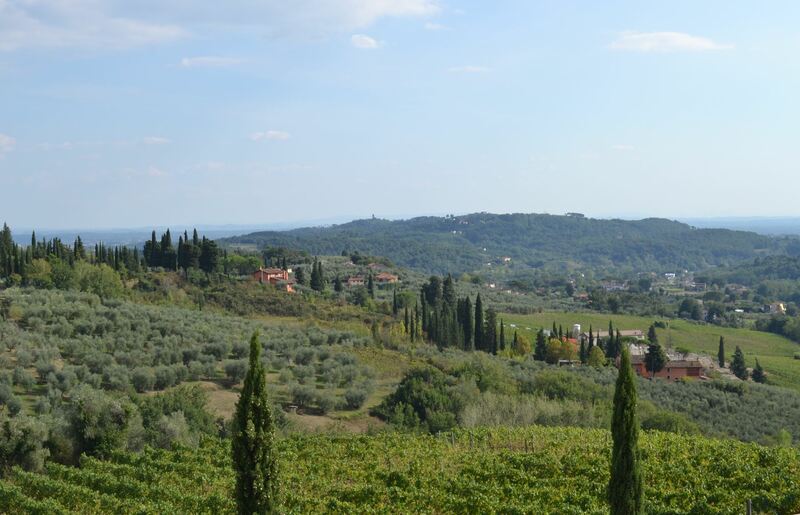 At the end of our visit, we returned to Lucca via a scenic route on a winding, hilly road passing many olive groves and took one last look at the lovely country side and the lake below which the composer loved dearly. However, our Puccini Day was not over; it continued at the Puccini Opera Recital which we attended at the Church of San Giovanni in the evening. The Festival, called "Puccini e la sua Lucca" is the only permanent festival of its kind in the world, meaning that every evening, even on holidays, there is a Puccini concert in Lucca, not only of his music but also other native composers as Boccherini and Geminiani. We listened to a remarkable concert of Puccini's and Verdi's operas performed in a splendid church which has great acoustics sung by professional singers. As I sat there listening to the concert it occurred to me that two weeks ago on September 25, our first day in Lucca , we began our Lucca visit at a concerto lirico for the benefit of the earth quake victims. It is late October, and la mia valigia has been unpacked, my souveniers have found their places in my home, and over 500 photos allow me to relive those wonderful days in Lucca, Italy. Each of the educational travel experiences are unique and multi-dimensional. As I reflect on those days, I vividly recall that Lucca is a city of music. Songs ring out continuously in the large piazza San Michele, below my window in the tiny Piazza Puccini, as local favorite, Mario, serenaded us during our welcome dinner, and certainly during my very first operatic experiences. I have never had the desire to appreciate opera, but the voices I heard were breath-taking, and now I am sold. There is no doubt. The city is alive with song. Our purpose on these journeys is to absorb the language, and it is surely difficult to ignore while spending nearly 4 hours per day in a classroom setting....an amazing experience! Once again, I gather with other students from around the globe; Australia, England, Norway, Belgium, as well as every corner of these United States. 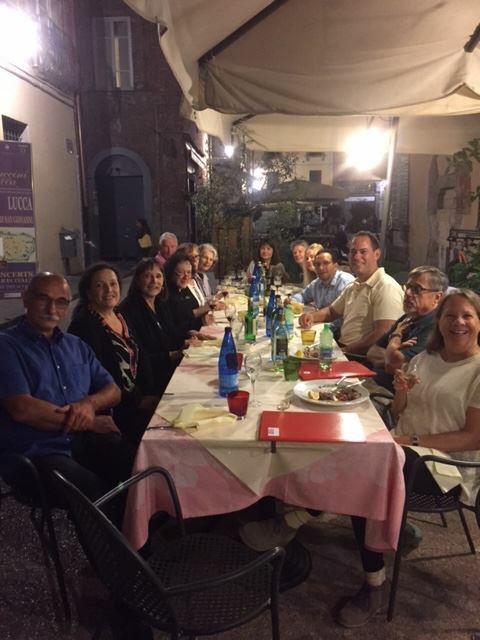 The Lucca Italian School administrators and staff are second to none, and I am learning. I struggle with the language in class, on the streets, in taxi cabs and on shuttles, at the hotel...and nowhere was my progress more apparent than at Sunday Mass in the church of San Michele. Did I really answer the questions an Italian woman had...in Italian....when the woman next to me spoke no Italian and could not respond to her?? I did...and little by little, I feel more confident. The people I encounter on these adventures always move me most. This year was no exception. Paolo, the proprietor at Hotel Piccolo Puccini, provided me with mini lessons in la bella lingua, and taught me how to correctly pronounce the maiden Italian name I have lived with my entire life. There were many wonderful cab and shuttle drivers, like Bruno, who sincerely wondered how Packer fans wear cheese on their heads! School proprietor, Angelo, lives on Via Bocchi (my maiden name) and loves Minnesota's Bob Dylan. His colleagues, Daniela assisted me with every detail of the trip and became my "friend", via email, long before I set foot in Lucca...and Eva, who has a personality which is contagious and explodes into the many passions all of us embraced. Finally, and most important, was my group of 10. 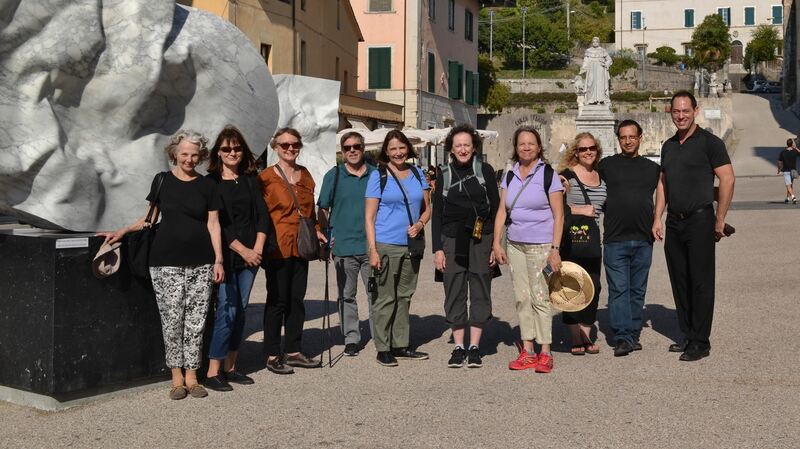 They were a diverse group, with a wide expanse in age as well as life experience...a mixture of men and women whose common thread is a love for all the wonders Italy has to offer. This group "bonded" like no other, and I would like to thank each of them for sharing those marvelous moments in Lucca, Italy with me. Grazie di cuore! Footnote: Tom and Julie, whom I mention in the first blog entry...and who could not make the trip with us, traveled to Lucca in November, 2016. 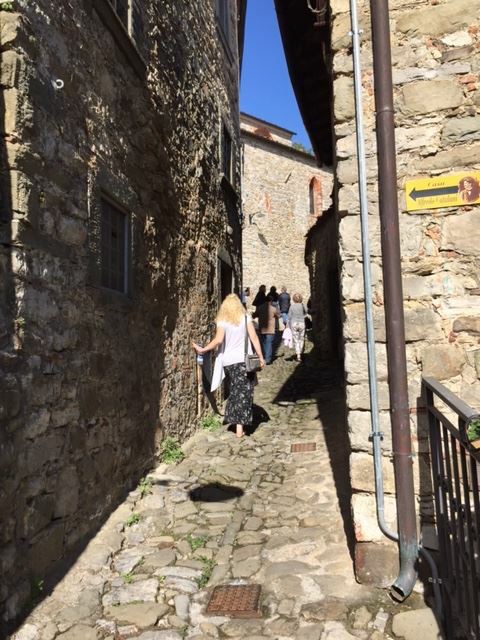 They were able to experience the Lucca Italian School, and have kindly submitted this blog entry which captures their experience. Enjoy it! If one is viewing recent Facebook postings from "Conscere Lucca," one will see a lot of postings of rain. Those postings do capture a large part of our experience. There were several times when Julie and I showed up at LIS in the late morning where we had difficulty finding a place in the porch area to stash our umbrellas. In spite of the rain, we had a great time and gained a lot from our stay in Lucca and the Practical Italian class and cultural activities offered by LIS. We had Eleinora as our instructor. We (Eleinora, Julie, and I) spent 15 hours going around Lucca and conversing in Italian. Both Julie and I had ample opportunity to express ourselves in Italian. I felt that I made great progress in expressing myself in Italian. I must admit, however, that I pretty much limited myself to the presente, passato prossimo, and futuro tenses. Our lessons included a tour of Lucca, a visit to the Contemporary Art Museum to view the Magnum photo exhibit, lunch at a drogheria, a walk around the wall, and a tour of San Giovanni church. 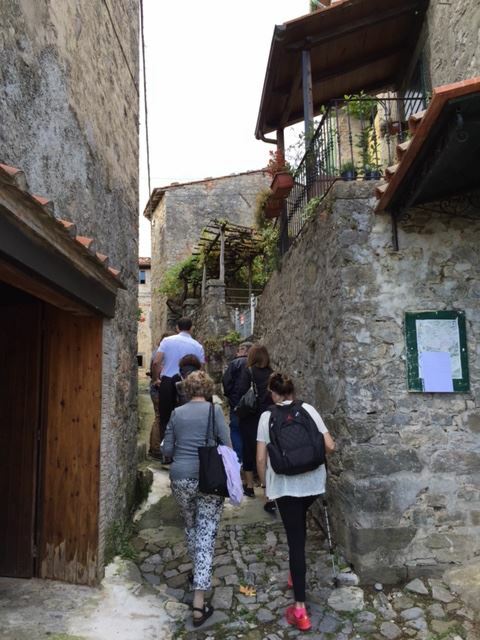 The cultural activities were an excursion to Forte die Marmi and Pietrasanta, a trip to an olive grove to see the harvesting of olives and an frantoio to see the production of nuovo olio, and a cooking class with Eva. We stayed in a very nice B&B called La Romea that was 2 blocks west of the Guinigi Tower. We could not get an early reservation at Das Pasquale so we did not eat there and Il Mercenate was closed for a week long holiday following the Comics festival. We did have some memorable meals including dinners at Vecchia Trattoria Buralli and Ristorante Canuleia and lunch Trattoria da Giulo. During our cultural activities I was surprised at how advanced the other people were in speaking Italian. Many have been taking classes at LIS over several years and were taking classes for more than two weeks. So, there were very few times when we were not speaking Italian.